Bruce's Jerky is a small smoked meat shop in Tawas City, MI, located on Lake Huron, at the mouth of Saginaw Bay. The shop actually has a large sign reading, "Bruce's Smoked Fish", but apparently sells a lot of beef jerky. The brand was recommended to me by one of my readers. This "Smoked Colorado Beef" was actually labeled simply as "Beef Jerky" when I purchased it from Bruce's Jerky's website. Bruce's Jerky doesn't actually make jerky, they only make smoked fish. The jerky they sell is private labeled through Michigan Brands, Inc., a meat processor in Bay City, MI. Michigan Brands distributes their jerky primarily this way, by private labeling through small retailers across the country. Michigan Brands offers several varieties of jerky, far more than what Bruce's Jerky offers under its own label. All of their varieties can be purchased through a chain of jerky retailers called "The Jerky Outlet" with seven locations throughout Michigan, as well as through their website. Beef, seasoning (salt, sugar, monosodium glutamate, 8.8% pepper and garlic powder, with not more than 2% propylene glycol added to prevent caking), sodium nitrite. The flavors I pick up from the surface of these pieces starts with a saltiness, and then some meat aroma. In the chewing, I get more saltiness, a slight smoky flavor, a slight meat flavor, and a slight peppery aftertaste. Pretty much the taste of this jerky is salt. It has a moderate intensity on the surface of these pieces, but a strong intensity inside the meat. I'm not sure it's "too salty" for my preference, but it might be so after eating several more pieces. It's perhaps more tolerable if I take longer pauses in between bites. Mixed into that saltiness is some peppery flavor, but clearly a distant second or third from the salt in terms of dominance. It's just enough to color the saltiness, and give me a bit of aftertaste. There's even a more faint garlic aftertaste as well. The natural meat flavors are there, but are light. I think the saltiness is strong enough that it makes finding the meat flavors difficult. There's a slight bit of smokiness in that meat. What I primarily taste in this is a good deal of saltiness, starting with a moderate amount off the surface, and a stronger dose all throughout the chewing. It's enhanced by a bit of pepper and faint traces of garlic, with a light meat flavor sitting underneath. These are strips of whole meat, cut into lengths varying from 2 to 12 inches, in thick widths. This is a soft and moist jerky, moist enough that it could pass as a kippered meat snack. The strips are very flexible and it actually requires a good deal of effort to break apart with my hands. It's much easier to bite off however. Chewing is easy. The chewing texture seems excellent, it's just like eating a steak cooked medium, very fibrous. The first few chews have a rubbery resistance, but the meat breaks down very quickly. I didn't get any mushy, crumbly, or gummy texture from this. As far as clean eating is concerned, there's enough moisture on this that I find myself licking up the water off my fingers. Otherwise, I found no tiny fragments falling from this. The meat seems very lean, I found no bits of fat on these strips, and no tendon or gristle. I did find some strips leaving behind small wads of unchewable membranous tissues, but otherwise this looks to be all meat. Bruce's Jerky sells this Smoked Colorado Beef from their website at a price of $25.00 for a 16oz package. You can't buy this in any smaller size. I actually bought this package, along with a 16oz package of their "Hot Beef", for a total of $50.00. Add to that $11.95 for shipping, and it came out to $61.95 for 32 ounces in all. That works out to a price of $1.94 per ounce, putting this into the average price range, but on the border with expensive. Note that you can get this same jerky from The Jerky Outlet for $17.99 per 16oz. 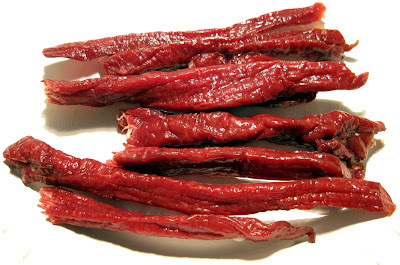 For general jerky snacking purposes, at the $1.94 per ounce price, it presents a fair value. I'm getting a good snackability mainly from its soft, moist eating and excellent chewing texture. The taste alone is ok, not bad, but not that spectacular. It's the meat consistency that seems to make this worth considering despite the higher price. The meat consistency in this jerky is good enough to make this above average, and therefore could have gotten a "good" rating, or even a "best" rating had the flavor been better. But the flavor of this jerky falls short of average because I found it largely uninteresting, mostly just a strong salty flavor, and a light meat flavor. The two basically offset each other, and leaves this jerky "average". All throughout eating this I couldn't help comparing this to Jack Link's Beef Steak, being similar in appearance. 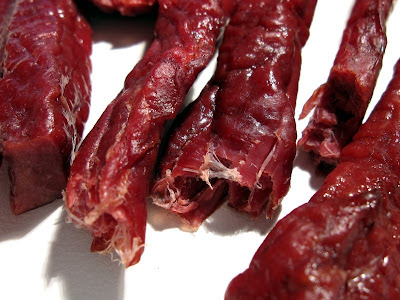 The Jack Link's however is more of a chunked & formed product, whereas this Bruce's Jerky is all whole meat. In terms of flavor, I'd give Bruce's Jerky the edge over Jack Link's. I think the sight of these jerky strips is also impressive considering their length, thickness, and moist feel. It creates a lot of snacking anticipation. It just be better if I could get more natural meat flavors from it. I think a good beer variety with this is a lightly flavored American cream ale, or German kolsch.